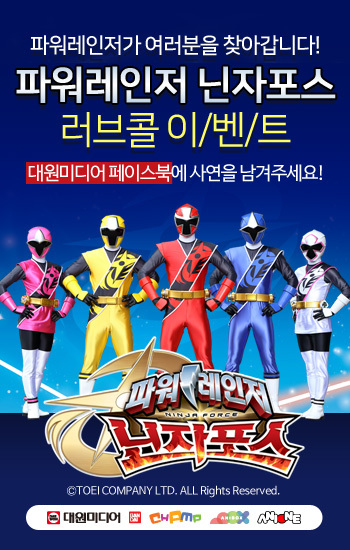 Join Power Rangers Ninja Force Event! Fans of Power Rangers cannot miss this chance to get a ticket for Ninja Force’s dance performance, a photo time, and Power Rangers Ninja Force toys! Please click Like at Daewon Media’s Facebook page, and write your story with a date/venue that you wish, from September 22, 2016 to September 31, 2016, as a comment under the event post of Daewon Media’s Facebook. Among the comments, three prizewinners (or team) will get a chance to participate in the event. The due date for the application is September 8, 2016, and the names of prizewinners will be announced on September 9, 2016. Time for the event will be about 40 minutes to 60 minutes. This event will be held in Seoul and capital areas only because of management issues. Event schedules and prizewinners can be changed or cancelled according to the circumstances. Daewon Media to open up café de One-Piece in Hong-Dae… Licensing business is activated. ‘Beijing Jiasheng Culture Industry Development Co., Ltd.’ which is a joint venture company of Daewon in China is established.